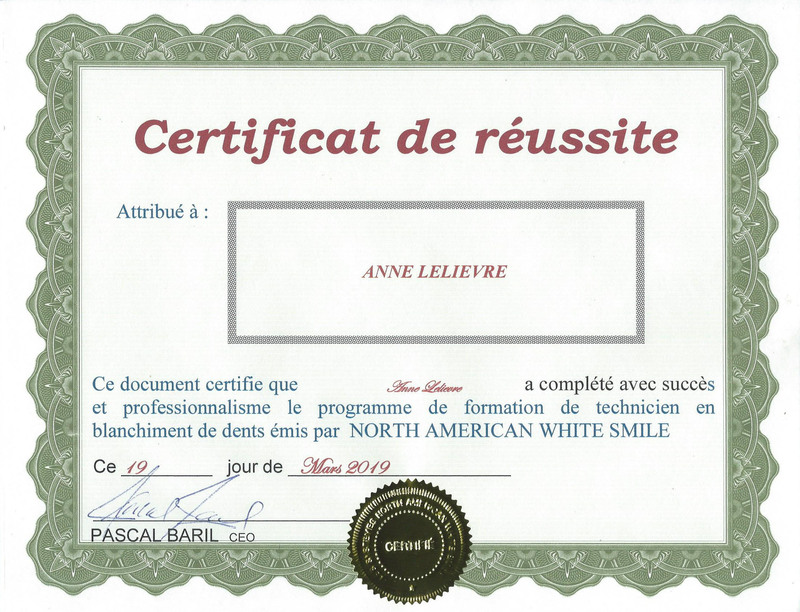 According to Health Canada, all teeth whitening systems are considered cosmetic products. We use the same products or peroxide formulations as your dentist. It is a simple and safe process for your gums and enamel. Our machine and all our products come from the United States. 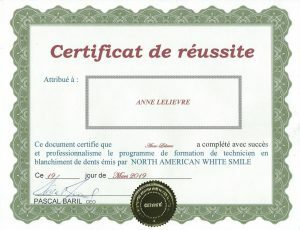 1. Who is not eligible to receive a teeth whitening treatment? – People who take antibiotics. 2. Could a teeth whitening treatment be harmful or dangerous? No, the recent scientific research done by the University of Leuven in Belgium has shown that when teeth are in a healthy and normal environment, there is no evidence of adverse aftereffects on the enamel or on the gums. 3. What types of substances do you use to perform a teeth whitening treatment? 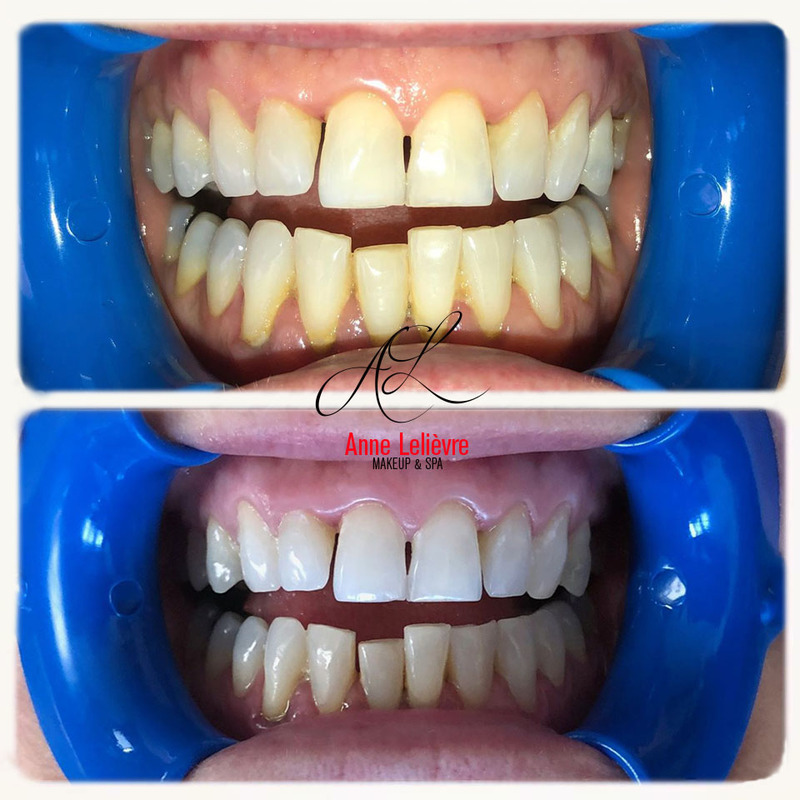 To perform our teeth whitening treatments, we use 35% carbamide peroxide (simple treatments) or 16% hydrogen peroxide (prestige treatments), the same ingredients used by dentists. 4. Can anyone get their teeth whitened? No, people who are too young or have had to take medications such as tetracycline are not eligible for this treatment. In addition, any discolourations or stains resulting from tooth decalcification due to excessive fluoride use as well as porous teeth will likely have limited results. Those who, through genetics, have gray teeth, will probably also not perceive a significant difference. Nevertheless, we assure you that more than 90% of people will have more than positive effects. Success is assured for healthy, trouble-free teeth. 5. Is the treatment guaranteed? The results are very satisfying for the vast majority of people. However, the results vary from person to person according to different characteristics such as: genetics, age and hue of yellowing. In most cases, people will obtain a good result from the first treatment. For optimal results, it would be ideal to perform a second and/or third treatment (20 minutes each) depending on the person. 6. 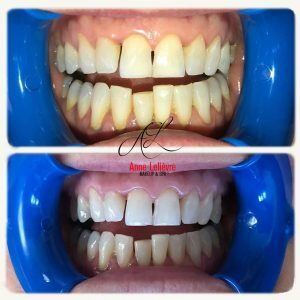 Is teeth whitening permanent? No, in the long run, the consumption of foods, drinks (especially coffee, soft drinks and red wine), smoking and other substances will obscure the whiteness of your teeth. It is therefore recommended to have your teeth whitened at least once a year. Thanks to our whitening process, your teeth will return to their original color. However, to maintain the whiteness of your teeth, it is recommended to do retouch-ups with our maintenance pen. 7. What should I do after my teeth whitening treatment? For a minimum of 24 hours after your treatment, avoid drinking coffee, tea, brown carbonated beverages, red wine, beetroot and any other foods or drinks that may stain your teeth. If your teeth are sensitive, you can use toothpaste for sensitive teeth and gums. It provides fast relief. We strongly encourage you to purchase our maintenance pen. This treatment has a duration of only 20 minutes. It is suitable for all those with healthy, well-aligned teeth who are not taking regular medications or who have been taking them for less than two years. This treatment has a duration of 15 to 90 minutes. It is suitable for all people who have been taking medication regularly for more than two years, who do not have all their teeth perfectly aligned, who have pain or sensitivity to cold and heat, who have certain loose teeth, facets or prostheses.